The first thing that I feel compelled to say is that I love the cover of this disc. It is arguably the best album cover of the entire year. It is befitting tat such a great disc would be adorned with such killer artwork. For those not in the know, California Guitar Trio are three alumni of Robert Fripp's League of Crafty Guitarists who create intriguing instrumental prog using nothing but acoustic guitars and some effects. The result can be stunning, and, although certainly musicians have the highest level of appreciation to what this group does, appeals to many. Their live shows are made quite famous by their rendition of Queen's "Bohemian Rhapsody" and classical pieces played one note at a time. That means each guitarist takes one note of the piece, moving around the song and their grouping. There is one such track here, a Bach piece. There is also an intriguing cover, their melding of "Ghost Riders in the Sky" and "Riders on the Storm". The disc is a very diverse one, and has a lot of wonderful moments. Longtime CGT collaborator Tony Levin produced the album, and adds fretless bass to one of the numbers. 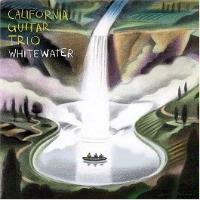 If you have never heard California Guitar Trio, this disc would be a great place to start. It is both a solid overview of what this group does, and a highly entertaining album. If you give them a chance you will probably be coming back for more. The album opener is a beautiful and dynamic ballad. At times it feels a bit like some of the acoustic guitar work of early Genesis. I have to say there are moments where it's difficult to believe this is only guitar. This is a bit more energetic than the previous piece, but still quite pretty. At times it feels a bit like Steve Howe's solo work, but it gets very playful in places. This one is quite fun. It's a bit more constant than the opener, but still manages to be dynamic, too. This almost has a cowboyish feel, but I can't place where that comes from. This one moves around quite a bit and feels rather jazzy at times. After a false ending it is reborn. Coming in with more of a folk rock texture, the band move their way around creating melody lines around the fairly constant grounding melody, using these excursions to provide the dynamics of the piece. Tony Levin adds fretless bass on this one. With a classical, piano sonata type of texture. this is actually adapted from a Bach composition for lute. CGT manages to include the first dissonance of the disc on this track. This frantic jam is amongst the coolest pieces on the CD. This feels at once classical and Crimsonish, then moves to a newer jam. That has a great dramatic overtone. This is another example of a song where it is hard to believe there are no keyboards. With its occasionally mid-Eastern overtones, I simply love this composition. This one comes across both as playful and contemplative. It's another that makes it hard to imagine that all the sounds were created on guitar. This really does feel like water moving frantically downstream. This is an organic and quick paced track. It features a segment that feels very classical, but then wanders into Crimsonian dissonance. The band pulls it back out to the earlier segments, though. As this progresses they take into rather flamenco territory. This is another highly dynamic cut. A strong fairly accessible rocker with a lot of echo involved, this is fairly static in song structure, but the band sure get creative overtop. One segment even has a metallic lead segment that feels a bit like Robin Trower, Jimi Hendrix and Jimmy Page rolled into one. Amazingly, although it sure doesn't sound like it this solo is all played on acoustic guitar. They jump up the key and tempo later in the piece. Moving back to the sedate, this is a gentle and beautiful song that again seems as though guitar can't be the only thing on show here. This gains a lot of intensity and fire as it carries on, turning into quite a rocker before dropping back to the opening segments to end. This fast paced cut is almost like an acoustic KC take on fusion jazz before dropping to a short countrified break. Then, the track alternates between these two modes before turning to a plodding segment that feels like early Black Sabbath talk about contrasts. They jump out of that segment to a jam that feels almost like new age, were it not for the slight dissonance. This cut changes more times and more drastically than most. As the title implies, this is a hybrid of "Ghost Riders in the Sky" and "Riders on the Storm". They begin and end the track with the number made famous by the Outlaws, using the Doors piece dramatically as an interlude. This is quite a cool number and a great way to end the disc.